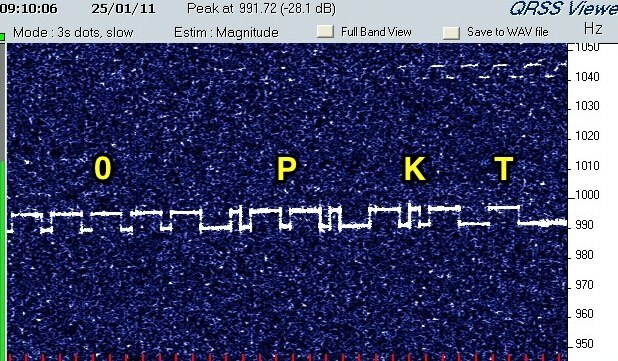 I arrived at work this morning to an email from Mauro, IK1WVQ to tell me that he’d spotted the G0PKT QRSS beacon on 30m. This is the first time we’ve had a reported signal and looking at the trace he sent me, the signal really was quite strong. It stayed with him for a large chunk of the day. We’re running this QRSS station at the Martello Tower and Tony, G0MBA also has one running at home on the same band. I’ve got one here as well but it’s only been on intermittently and it’s been running through my SGC Smartuner into the long wire aerial. I suspect that none of the 150mW output has actually got through the tuner into the wire! This evening I knocked up a small dipole to the same design that Hans Summers has on his website and I’ve run a 30m dipole around my loft. The wire is dragging over stuff and effectively is in a ‘V’ formation so it’s really going to be inefficient but I’ve got more chance of being spotted with this than I had with the transmitter connected to my long wire. I’ll run it like this for a while and see if anyone spots me. QRSS is all about being patient, everything happens slowly. This entry was posted in Amateur radio, Construction, CW, HF, QRSS, SSB and tagged Hans Summers, QRSS, QSO365. Bookmark the permalink. 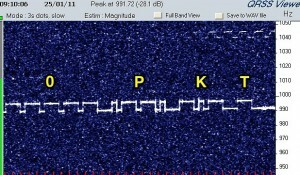 One Response to QRSS, woo!